Passionate and curious, always learning. I love to teach and to explore. I enjoy traveling to wine regions and discovering new wines!. A.J. is the Wine Director at The Lambs Club, The National in Greenwich CT, and Georgie in Beverly Hills. 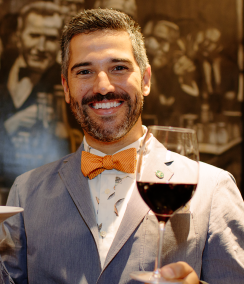 He is currently overseeing the continuously growing international wine program for Geoffrey Zakarian’s restaurants. A.J. can be seen making his rounds throughout the dining room enthusiastically serving guests and providing his expertise recommendations. A.J.’s passionate enthusiasm for his craft is contagious to diners, fellow colleagues and wine enthusiasts alike. Continuously educating himself and seeking out unique selections, A.J. brings a wealth of knowledge, and style, to all he serves.Born in Caracas, Venezuela and raised in New York City, A.J. Ojeda-Pons took a strong interest in wines at a young age. After composing and studying music in college, it was his exposure to fine dining restaurants in Manhattan that opened his mind to the world of wines. A.J has worked with some of the best restaurants in New York and recently earned The Lambs Club the prestigious Two Glass award from Wine Spectator, noting The Lambs Club as having one of the best wine lists in the United States. As well as Three Stars on the World’s Best Wine List from The World Of Fine Wine.